The fi-7460 is easy to set up, use and maintain and comes bundled with a user friendly and intuitive scanner driver PaperStream IP along with batch scanning automation and enhancement software PaperStream Capture. 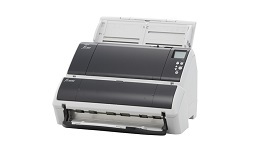 A4 landscape scanning speeds in both color or black and white at up to 300 dpi is 60 pages per minute or 120 images per minute through the 100 page capacity ADF. The fi-7460 can scan a huge variety of material from plastic cards to booklets to even folded A1 in size. 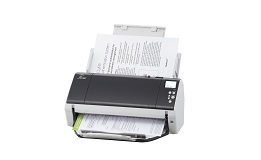 The fi-7460 can efficiently scan a large amount of documents. The ADF paper chute (feeder) can accommodate 100 sheets (A4 sheet, 80 g/m2 ) and additional papers can be added while scanning. Furthermore, it also includes several functions to ensure reliable scanning.